Midbrain is the middle part of the vertebrate brain. In most animals except mammals, the midbrain processes sensory information. 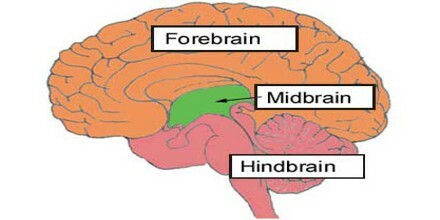 In mammals, it serves primarily to connect the forebrain with the hindbrain. The forebrain is the ‘front’ brain and is composed of the cerebral cortex, the area that most people think of as the ‘brain’; it’s the ‘supercomputer’ of the human body. 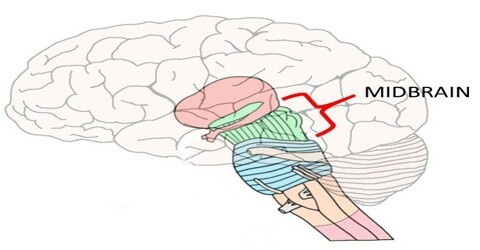 The hindbrain, or ‘back’ brain, is composed of the cerebellum and the pons and medulla oblongata or medulla, for short of the brainstem; it is evolutionarily the oldest part of our brain, controlling primal instincts and automated actions of the body, such as our ‘fight or flight’ response and heart rate. The midbrain serves important functions in motor movement, particularly movements of the eye, and in auditory and visual processing. It is located within the brainstem and between the two other developmental regions of the brain, the forebrain and the hindbrain; compared with those regions, the midbrain is relatively small. The midbrain comprises the tectum, tegmentum, the cerebral aqueduct, and the cerebral peduncles, as well as several nuclei and fasciculi. The main function of the cerebral peduncle is to transfer motor signals from the brain down to the brainstem. It’s made up of a thick bundle of nerve fibers, called the corticospinal tracts, which carry motor signals from our brain to your muscles. Don’t be fooled, though; the cerebral peduncle isn’t just a ‘truck driver,’ carrying its ‘cargo’ of motor signals from one location to another; it also communicates with the cerebellum and, in doing so, helps to fine tune our motor movements. The tectum makes up the rear portion of the midbrain and is formed by two paired rounded swellings, the superior and inferior colliculi. The superior colliculus receives input from the retina and the visual cortex and participates in a variety of visual reflexes, particularly the tracking of objects in the visual field. The inferior colliculus receives both crossed and uncrossed auditory fibres and projects upon the medial geniculate body, the auditory relay nucleus of the thalamus. 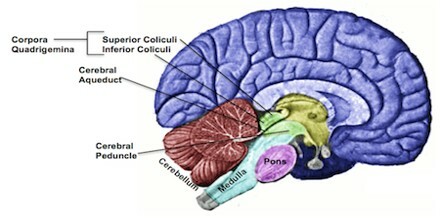 The corpora quadrigemina is a structure located on the back side of the brainstem and hidden by the cerebellum. It’s actually a funny looking little structure because, if we were to flip the cerebellum down, it would almost look as if the brain were ‘mooning’ us. The substantia nigra is a large pigmented cluster of neurons that consists of two parts, the pars reticulata and the pars compacta. Cells of the pars compacta contain the dark pigment melanin; these cells synthesize dopamine and project to either the caudate nucleus or the putamen, both of which are structures of the basal ganglia and are involved in mediating movement and motor coordination. A horizontal (transverse) cross-section at the level of the superior colliculus shows the red nucleus, the nuclei of the oculomotor nerve, and the cerebral peduncles or crus cerebri, and the substantia nigra. 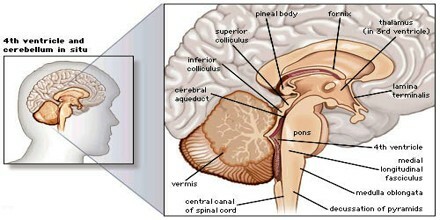 A horizontal (transverse) cross-section at the level of the inferior colliculus still shows the substantia nigra. Also apparent are the trochlear nerve nucleus, and the decussation of the superior cerebellar peduncles. Both sections will show the cerebral aqueduct, which connects the third and fourth ventricle and the periaqueductal gray. The midbrain also contains a portion of the reticular formation, a neural network that is involved in arousal and alertness. Cranial nerves in the midbrain that stimulate the muscles controlling eye movement, lens shape, and pupil diameter form the nuclear complex of the oculomotor nerve and the trochlear nucleus.